“Mr. Deane, for all his talents, was given to one particular flaw. He saw the world as he wished to see it. But as we know, an optimist is simply a man who hasn’t heard the news. As my time in the African Rifles had taught me, one ignores the elephant in the room at one’s peril.” The Major quoted for Mr. Deane. This quirky comedy made my wife and I laugh really hard! We found it fun and enjoyable. The film was directed by Michael Hoffman and the score was done by Rolfe Kent who also did some other quirky comedic film scores as well. What is the plot of Gambit? 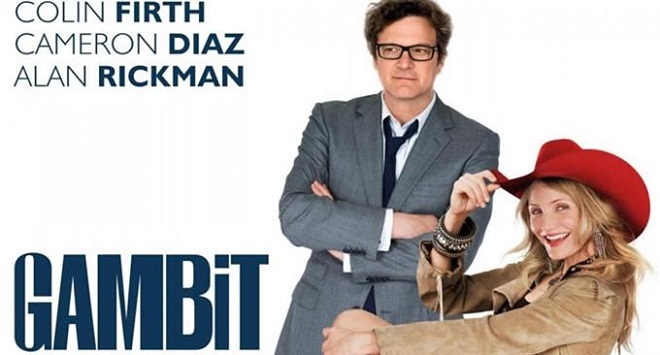 Here you are…A mild-mannered art curator (Colin Firth) plans to scam his abusive boss with the help of an expert forger (Tom Courtenay) and a rodeo queen (Cameron Diaz). Easy plot and the fun part is that Alan Rickman played the boss. I enjoyed this film and its fun music in all its glory. Here is a preview of the score. Hope you enjoy it enough to buy the soundtrack, its alot of fun. Thats all for today, look forward to Sunday’s post Star Trek IV: The Voyage Home. Happy Listening!